Service virtualization is a powerful, proven, and collaborative technology that enables software engineering teams to more accurately model the real-life behavior of software prior to production. By removing the constraints and wait time for assets to be complete and available, service virtualization solutions deliver on the promise of better business outcomes. Your teams can work faster, release more reliable software, and delight the business. Purchase on-demand access for individual, non-commercial use or contact voke to inquire about a reprint license for commercial use. Need to educate others about service virtualization? Check out this IT Superhero book! As the line of business demands accelerated time-to-market and high-quality software, teams must use proven solutions to deliver better business outcomes through software. This report highlights the need to bring virtualization technology to the pre-production portion of the software lifecycle to provide developers and testers with production-like environments on-demand. By incorporating lifecycle virtualization solutions into your software lifecycle, you will help protect your brand and your business. Interested in reading other voke Market Mover Array reports? Find more. We live in a fast-paced world where people are constantly pressed for time. And we expect our content to be delivered in easily digestible formats. To help you succeed, voke is now offering voke Impact™ Note—a new shorter report format that is intended to be brief, easy to read and impactful. Each Impact Note includes a short overview about a market need paired with a unique value proposition or best practice tip from an application lifecycle vendor. Read voke's analysis on specific products and solutions. 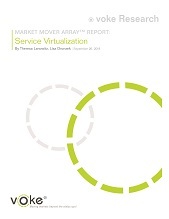 Compare the market moving vendors: CA, IBM, MicroFocus, Parasoft, SmartBear, and Tricentis in voke's service virtualization research! Need to test faster with service virtualization? Compare the market moving vendors: CA, IBM, MicroFocus, Parasoft, SmartBear, and Tricentis in the Market Mover Array! Take a proactive approach to IT security. Download voke's Impact Note on Bromium. Listen to Parasoft and voke discuss continuous testing, service virtualization, and the new role of testers in this video.